A Recent Visit to The Sixth Floor Museum Brings on a Paranormal Experience! 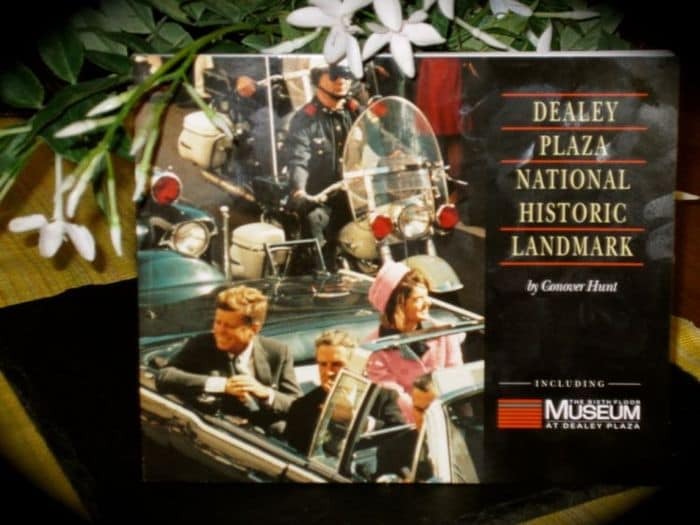 On Friday, May 18th, I paid Dallas, Texas (the town I grew up in) an unexpected one day visit, with the sole purpose in mind of visiting The Sixth Floor Museum at Dealey Plaza. My last visit to the museum was in the late winter of 1989, just shortly after it opened. That’s 23 years ago, so I figured I would pay the museum another visit, to see if anything had changed, or to see if I had experienced a metamorphosis in my perspective of what may have happened there, on that tumultuous day in November of 1963. I gathered up a few travel supplies, packed my ancient suitcase, drank down an ample dose of black coffee, then took off like a bat out of hell (at 6:30 in the morning) in my trusty but steady, 1999 white, Ford F-150 pickup truck. The details of my road trip were mostly devoid of any excitement, but I will mention the fanciest rest stop I’ve ever been to in my life, which is at a Jarrell exit, just a handful of miles north of Georgetown. This rest stop more resembles a museum, with exhibits and history placards, one of which covers the May 28, 1997 Jarrell tornado, which nearly devastated this small Texas town. While the tragic story of this natural disaster is a diversion to what I’m trying to describe for you here, I noted (in my meandering travel reverie) its occurrence was around a year and a half after I left Dallas for good, making a move to Austin permanent. This morning (5/28/2012) I did some research on the rare tornado event, watched some YouTube videos of news footage dating from the event, and otherwise made attempts at some reconstructions of what I was doing or thinking at that time, in the late spring of 1997. Efforts such as this, the application of the mind to recall certain traumatic calamities, the specific context of such salient milestones, have served me well through the years. Yet attempts at this self-same-named process, with reference of my visit to The Sixth Floor Museum, resulted in nothing other than convoluted memories of propagandistic museum exhibits, that wished to do nothing other than propitiate the awkward findings of The Warren Commission. I sensed I was wrong about my memories of my initial visit, and this is what propelled me forward to give it a second glance. I’ll cut short what I did on Friday afternoon, other than to tell you I drove around my old haunts, which were mainly in the Cedar Springs district of Dallas, and observed how much it had changed since I left it in November of 1995. I did drive down Knox Street and noticed how many high-end retail stores were in business these days. To my chagrin, what use to be my favorite bar in the late 1970s, The Knox Street Pub, is now a Chili’s. I did manage to cruise down Cedar Springs Drive also, and I passed by the legendary location of The Lucas B & B eatery, and passed by the former location of Phil’s Delicatessen, where Jack Ruby had purchased those ten corn beef sandwiches (taking them over to the Dallas police station) on the night of the assassination. 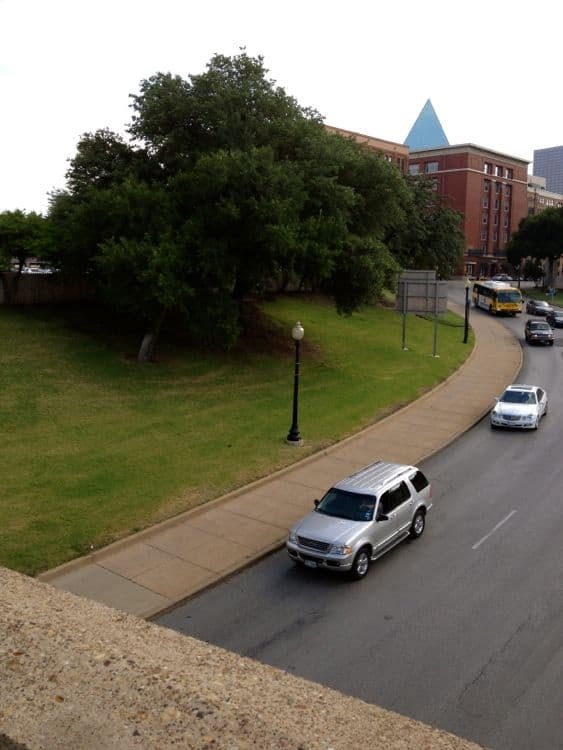 Well, I stayed at a cheap Motel 6 (only $45) on Forest Lane, checked in early, and went to bed early, so I’d be fresh as a daisy in the morning (5/19/2012) for my much anticipated Dealey Plaza visit. I arrived at 9:00 AM, about an hour before they open on Saturdays. I parked right next to the railroad tower, where key eyewitness, Lee Bowers had been situated that frothy Friday afternoon, as the motorcade pulled into the Plaza. I walked over to the iconic picket fence and looked out at the noticeable X mark, smack dab in the center of Elm Street. I also observed that the original picket fence had been replaced since the last time I’d visited the Plaza. It looked very different to me and I was disturbed by the fact that the original area behind the white park pergola, and what we know now as The Grassy Knoll, had been considerably altered from its pristine condition (on November 22, 1963). I’m zealous about historical preservation, and believe the park should be as authentic as possible, as it was during the event that it shies away from commemorating so dearly. Then I walked over to the trestle than runs over the Triple Underpass and looked down (from a birds-eye perspective), at the awesome view over Dealey Plaza. I carefully took a few photographs with my iphone 4s and stood in marvel at what a splendid gaze some witnesses had of the motorcade as it rounded the sharp curve of Houston onto Elm Street. S.M. Holland, a railroad worker, was perhaps the very best witness to the assassination; Sam saw the President slump down in his seat, and saw the flagrant puff of smoke emerge out from under a clump of trees in proximity to the picket fence. While still in a daze from this experience atop the trestle overpass, I walked over to a quaint little bookstore, which is located at the Dal-Tex Building just across from the Texas School Book Depository Building. I still call these buildings by their former names, even though they have changed their names many years ago. This is a fantastic bookstore and has many interesting Kennedy trinkets and souvenirs, and so many significant monographs on Jack Kennedy! 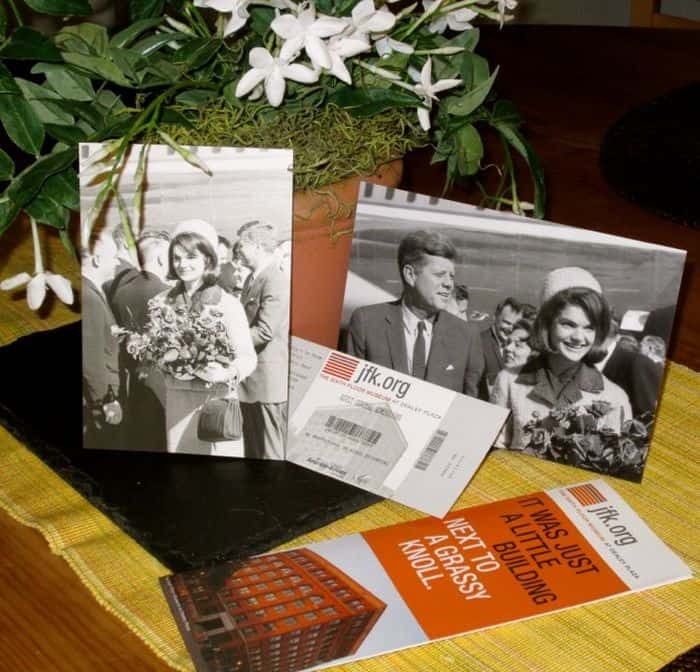 I purchased several commemorative postcards and made a mental note to return there and pick up a good number of titles that tell the Kennedy story all over again. It took a while to get into the actual museum, the line of visitors was long that Saturday morning, but finally I was riding in the elevator up to the Sixth Floor, where Lee Oswald once shuffled heavy school book boxes around with his trusty two wheeler. I took a slightly different approach than what most would take as I walked around the exhibits. I took a non-analytic approach, didn’t read many of the placards very carefully, and simply lumbered around from place to place to see how each particular space made me feel. My audio tape stopped frequently, but this was not of any concern to me, really. Through the years, I’ve memorized all this stuff, so I didn’t need any extraneous information about Jack’s trip to Dallas. Mind you, I looked at it, but I was much more curious how I’d feel when I looked out the window, or looked at the simulation of the stacked book boxes at the supposed sniper’s perch. What was I after here? I was looking for a paranormal experience, I now realize, of some strange men rushing down the stairs and dashing out the back of this eerie red-brick edifice. I did have a small epiphany of this, a scorching sensation, or flash of pigeons flying madly in the virtual moment of resounding rifle fire that echoed over the Plaza like smoking hot Santa Anna winds. An ability to hypnotize yourself into a whirling instance of historical transformation, is a particular skill I’d likely bet my life on. We know now that more than one man was up there when shots went off. Just look at the Orville Nix clips. Oswald wasn’t on the Sixth Floor at 12:30 PM. I made a note to study the Camera Exhibit more carefully on my next visit. Staring at replicas of these vision-infested motion picture cameras had (probably) induced my flashes of the real suspects up on The Sixth Floor.